If you don’t love guineps, maybe you’ve never tried the right one. Every guinep connoisseur knows that no two guinep trees produce the same tasting fruit. I challenge anyone to prove me wrong. I’ve had fruits from many different trees from the same hillside in St. Catherine and they all have their own unique characteristics. Some are juicy, some are creamy, some are sweeter, and some are more stainy. I’ll even go as far as saying that fruits harvested from the same tree at the same time can also taste different as they ripen at different rates based on the height of the branch from which they were detached. So if you’re not yet a guinep lover, hang in there. Your perfect guinep is waiting on you. Just keep at it. I don’t know when this love/obsession started but I do know that it’s here to stay. My earliest memories involving guineps were from the summers that I spent in John’s Hall, St. James. As soon as they were ripe, my relatives would cut a loaded branch from a tree just for me. Every day I would go back to the same spot and spend hours by myself consuming as much as I could. No competition, no distractions. Just me and my favorite fruit. It’s an experience and peace that I enjoy to this day whenever I consume this beloved fruit. It’s like going back to a simpler time. No mortgage, no deadlines, no homework, no chores. Just two full months of summer to do whatever you want. In Jamaica, the peak season for guineps is the summer months, although I have had freshly picked guineps in November and February. Maybe the predictable, seasonal nature of this fruit is a part of the allure. It’s not available all year round as mangoes. It’s not as illusive or as expensive as lychee or rambutan. It’s available in abundance for only a few weeks every year. One day it’s everywhere and the following week, it’s gone. Fortunately, guineps can be found across the Caribbean and Latin America, so this treat can be enjoyed by everyone with an appetite for awesomeness. A few years ago, I was in New York City and saw guineps on a fruit stand. The vendor said that they were from the Dominican Republic. They tasted like nothing I’ve ever had in Jamaica but I had to purchase his entire inventory, just because. Guineps taste awesome. No one would be crazy about them if they didn’t. The best thing however is the fraternity of guinep lovers. If you thought that I was the only one or the best of them you are wrong. You may be wondering, how can you know for sure if you or someone you know are true guinep fanatics? No worries, I can help you with that. Do you think that you can tell the difference between guineps from St. Catherine and Clarendon, and St. James and Trelawny? Can you tell if a guineps was harvested from a tree that’s on a hillside or down in a valley? Do you buy guineps before tasting because you’d get them anyway even if they didn’t taste as good as you’d like? Have you ever walked from New Kingston to Halfway Tree just to get guineps at every traffic light on the way? Do guineps vendors go home for the day after you pass through? Quota met! 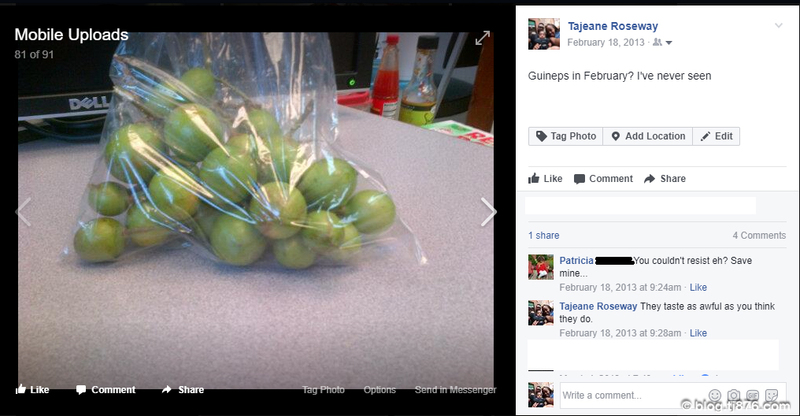 Do your friends tag you in their guinep pictures on social media? Do you store guineps in your freezer to be consumed out of season? Do you know that sour guineps are more palatable two or more days after they are picked? If your answer to all of the questions above is No, then there is still hope for you. It’s not too late to buy more than 10 bunches of guineps from your favorite vendor, tag your guinep loving friends on Facebook or Instagram, and put away a few bunches in your freezer for a rainy day.